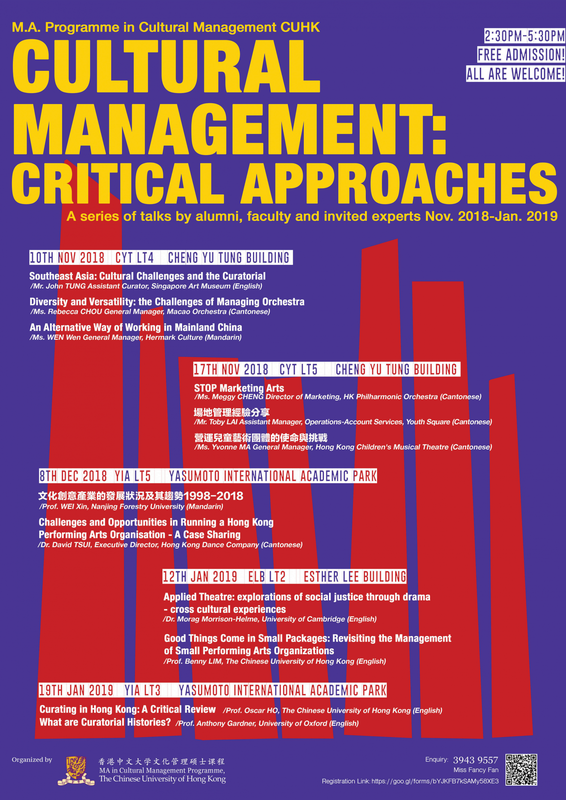 As cultural management becomes an increasing needed profession in Hong Kong and within the region, the M.A. 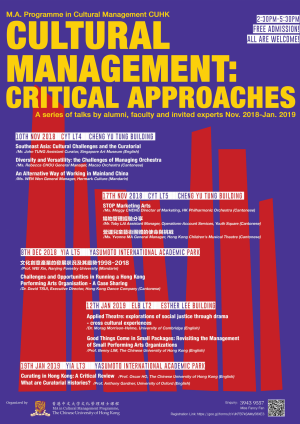 in Cultural Management of the Chinese University of Hong Kong organizes a series of talks giving in-depth understanding of the philosophy as well as practices of cultural management for our students and for public. In addition to our seasoned teachers and outstanding guest speakers, our talks also include some of our alumni. Over the years, our alumni are occupying some important positions in various major cultural institutions in Hong Kong, Macao, Mainland China, Singapore, Japan and as far as Indonesia. We are proud of what our programme has contributed to the fast development arts scene in Hong Kong and in Asia. The emphasis on 'critical' is part of the philosophy of our programme, in which we believe that the ability to think and rethink about the practices of cultural presentation and interpretation is as important as learning the technical skills. As the only cultural management programme in Hong Kong that provides a comprehensive learning in cultural management, we will continue our support in contributing knowledge and training for a more substantial development of arts and culture.